Chalkdust and Boots: Geek [Chic]! So, guess what was waiting for me at my friendly neighborhood optician's when I came home from work yesterday evening? No, not sunglasses. Those glasses, but with a clear lens. I've joined the legions of hipster douchebags wearing Ray Ban Wayfarers (mine are the square kind) as their prescription sunglasses -- at least I was wearing skinny jeans when I ordered them. I've worn glasses since I was six: that's over twenty years of spectacles. When I started wearing contacts at twelve/thirteen, I kind of never looked back. I avoided my glasses like the plague. In college, I bought my first pair of cool frames, your generic black rectangles. I kind of hated them immediately. 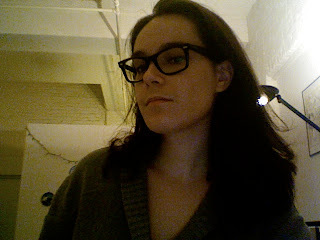 After starting to get into other people's personal style and internet blogs (and amassing an inspiration folder in my computer filled with pictures of women in big glasses), I realized that glasses could be kind of wonderful. I kept on gravitating towards pictures of women in obvious glasses: they weren't trying to hid them -- geek chic! In February of 2008, I bought my last frames, which I fell madly in love with and then? I really never looked back. I pretty much stopped wearing my contact lenses. At work, I'm pretty much known as "the one with the glasses." While I would've hated that sort of moniker five years ago, now I wear it with pride. Coming into my eye exam, I knew that I'd have to ask about the Wayfarers. Every time I wore my glasses, I kind of wished they were bigger. And, one of my biggest style icons ever, Louise, rocks the Wayfarers. I bit the bullet, fell in love, and here they are. Geek chic! Welcome to what I look like when I begin to come down with a cold and when my husband is laid up in bed with a fever for over twenty-four hours (chic!). My husband and I both really like the frames. I hope that it's more of a Louise effect than a Flo one. I can't wait to start playing around with hairstyles and make-up to most maximize my geekiness. God forbid anyone mistake me for anything else.